Well - one of our dreams was realized in 2014. Our daughter Nicole decided she liked playing music with Mom and Dad. She is bringing her talent to the stage with us. Nicole has a voice you will really enjoy! She also plays the Piano, Mandolin and Fiddle in the Band. We do a lot of three part harmonies and I really enjoy it. She wants to play as much as possible - so I have been booking the Band quite regularly. We also add a drummer to the mix if the price is right, otherwise we are a trio. 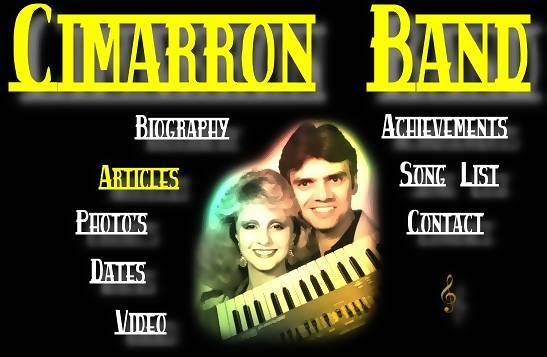 I will be adding more videos to the web page - I have added some Youtube links on the Video Page. WORDEN --- The Big Sky Country Music Association named Worden's own Cimarron its 1999 Band of the Year at its annual benefit and awards ceremony held on Mar. 5 at the Elks Club in Billings. Cimarron is made up of Andy and and Laura Wilson, who own Dinty's Bar and Grill in Worden, and Laura's brother, Ron Garritson. "We were kind of shocked... I didn't even know we were nominated," Andy said of the award. The band specializes in three-part harmony, a la Sons of the Pioneers. "People really go wild when we sing Tumblin' Tumble Weeds," he said. and Maruric Deverill, Big Sky CMA president, expects this years event will top that. Proceeds from the benefits this year will go toward Nursing scholarships. Andy Wilson likens the Big Sky CMA awards to having a Grand Ole' Opre Billings-style. The event is held annually on the first Sunday of March. Numerous band were at the benefit, where a large crowd packed the club and danced from 1 to 8 pm. Deverill estimates attendance at over four hundred people. "Band come from all over for this. We had folks in from Helena, Big Timber, Wyoming, South Dakota," as well as all around the Yellowstone Valley said Deverill. Sitting in with Cimarron at the event were Shorty Spang on drums and Benny Milks on fiddle. The Wilsons' 6-year- old daughter Nicole also sang "Could I Have This Dance." She aspires to sing and play piano with her parents someday. Andy Wilson has had the band for twenty years, with wife Laura joining him sixteen years ago. Southbound, Painted Dreams, and Old Betty's Bunch, among others. Other awards include Jimmy Goodman as Musician of the Year, on steel guitar; Jimmy Dressler as " Vocalist of the Year; Pappy Ellison and Vern Miller both received Hall of Fame awards; and the Pioneer Award went to Marlin Pain. Dinty's will be holding an open jam session this Sunday, March 12th from 4 to 10 pm. When Cimarron band takes the stage, audience will hear everything from Pop to Yodeling. The husband and wife team even serves up a Rap rendition of the theme from "The Beverly Hill Billies." Cimarron Band, which is Andy and Laura Wilson, is performing nightly through April 9 in the Gazebo Lounge at the Silver Club Hotel-Casino. While Andy plays guitar and foot-controls a drum machine, Laura plays piano and two synthesizers with one hand while operating while operating a keyboard bass with her other hand. Cimarron Band is equally at home with Country, Pop or standards from the 50's, 60's, and 70's.